Keyless locks installed on gates offer added security and remove the risk of children getting ahold of keys. Many varieties of keyless locks are available including compatible gate boxes. Double Combination (DC) locks are recommended for gates to prevent the risk of individuals reaching through or over the gate to open it. Safety gate latches are an effective solution for preventing small children from accessing pool areas when adult supervision is not possible. The opening mechanism is located out of reach and a magnetic latch ensures gates shut completely every time they are closed. The systems can also be locked/unlocked with a key. Hydraulic gate closers ensure gates close smoothly and completely. With constant closing pressure, the systems (when combined with an effective latch), ensure gates close completely, every time. Gate closers with adjustable closing speed are also available. Self-closing gate hinges are another effective tool to ensure gates close every time they are opened. The hinges' closing speed is tension controlled, and heavy-duty variations will close gates up to 154 lbs. Safe pool and spa covers and nets can add safety to pools by limiting the risk of drowning as a result of a child falling on top of, or attempting to walk across a covered pool or spa. Safe pool and spa covers are recommended to be used in coordination with other pool safety steps. Safe pool and spa drain covers comply with Federal Law including the Virginia Graeme Baker Pool & Spa Safety Act. The drain covers are designed to prevent entrapment and hair entanglement. 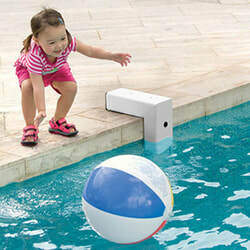 Pool, door and gate alarms add an extra layer of safety to swimming pools. Door alarms are recommended for homes that have doors that open direct to a pool area. In some states, they are required. Reference state laws and local codes for requirements and recommendations. © 2017 | LockeyUSA Inc.